COSMIC officially started 1st of January 2018. To further define the research projects and the training for the fellows Beneficiaries and the Partner Organisations of the consortium gathered in Amsterdam for a two-day kickoff meeting. During the first day both the Beneficiaries and Partner Organisations participated. On the second day the research programme was further discussed with Beneficiaries only. Part of the COSMIC consortium. From left to right: Olivier Gandrillon (Inria), Stefano Casola (IFOM), Michael Berthold (KNIME), Sebastian Binder (replacing Michael Meyer-Hermann; HZI), Daniel Primo (replacing Joan Ballesteros; Vivia Biotech), Niek de Vries (AMC), Judith Farres (Anaxomics), Jeroen Engelberts (SURFsara), Martin Turner (Babraham Institute), Fabien Crauste (Inria), Maria Martinez (IBM), Kostas Stamatopoulos (CERTH), Antoine van Kampen (AMC), Laurian Jongejan (AMC) Jeroen Guikema (AMC), Rikard Holmdahl (Karolinska Institutet), Eva van Ingen (Elevate Health), Malin Hultqvist (Redoxis), Eva Brinkman (Science Matters). Not on picture but present: Tjitske Bezema (Immunowell), Celia van Gelder (DTL). 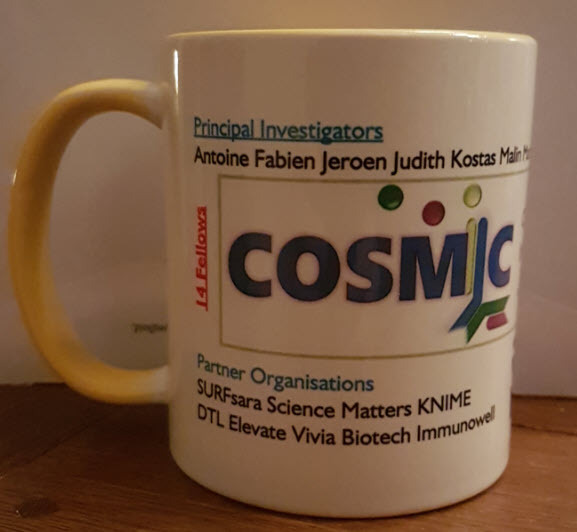 During the first day the status and the overall aim of the project were presented by Antoine van Kampen to also clariy the project to the Partner Organisations who do not all have a background in immunology and/or computational sciences. Importantly, we are currently recruiting the fellows and further effort is needed to define their (initial) research project, and to prepare the training during their first year (2018) and during the workshops of the First Annual Meeting (beginning of 2019). The first few deliverables have already been fulfilled (e.g., Website, Social Media, start with outreach, etc) while other deliverables (e.g., Data management plan, Dissemination plan, Ethics) are due for this year. Work to do! Antoine van Kampen (AMC) explaining the germinal center reaction. Subsequently, the Work Package (WP) Leaders gave an introduction to the research questions in their WPs and the collaborations that they forsee between the WPs. Jeroen Guikema introduced the B-cell lymphoma WP (WP3). Rikard Holmdahl introduced the Rheumatoid Arthritis WP (WP4). 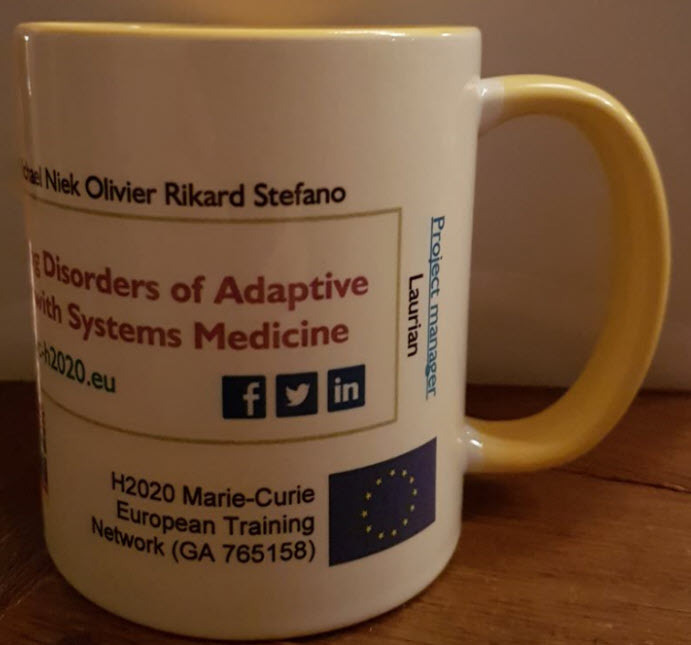 Finally, Sebastian Binder introduced the Computational Disease Models WP (WP5). The WP leaders gave an general introduction about B-cell lymphoma (BCL), rheumatoid arthritis (RA), and computational modelling to facilitate a better communication between the project participants. Jeroen Guikema (WP3 leader; AMC) introducing different types of B-cell lymphoma. Rikard Holmdahl (WP4 leader; Karolinska Institutet) introducing the different phases in rheumatoid arthritis . Sebastian Binder (replacing Michael Meyer-Hermann; WP5 leader; HZI) introducing different computational modelling approaches. After lunch each of the Principal Investigators presented in 10 minutes (a huge challenge!!) the first-year research project of their fellow. These presentations prepared the stage for the second day during which the Beneficiaries discussed these projects and further collaborations within/between the WPs in more detail in smaller groups. Getting to know eachother during lunch. Kostas Stamatopoulos (WP3; CERTH) presenting BCR signalling in B-cell lymphoma. Niek de Vries (WP4; AMC) explaining (the clinical onset of) rheumatoid arthritis. Maria Martinez (WP5; IBM) explaining her computational approach to address BCL and RA. Jeroen Engelberts (Partner Organisation; SURFsara) presenting computational facilities at SURFsara. Eva Brinkman (Partner Organisation; Science Matters) introducing the contribution of Science Matters. This concluded the first day after which we went for dinner to continue discussion. During the second day we proceeded discussions in smaller groups (per Work Package) and concluded with a round table discussion to wrap-up the kick-off. 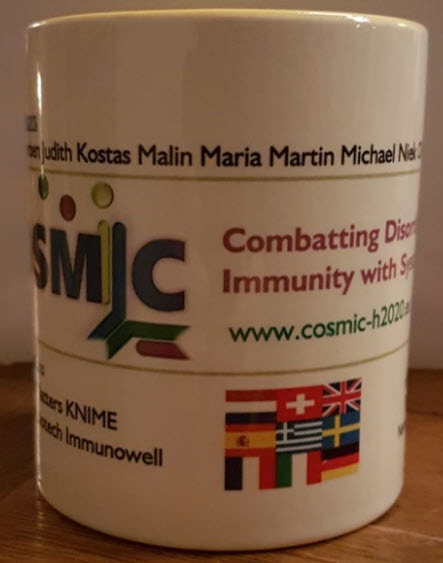 During the kickoff all participants received a coffee mug (the first COSMIC merchandise!!). In addition, the first COSMIC video was launched. See our COSMIC YouTube channel .